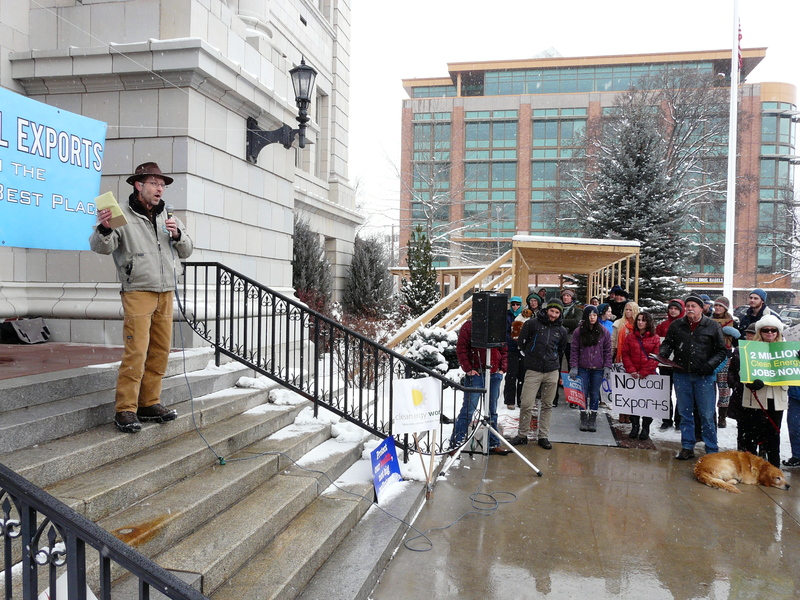 Today, February 22nd, more than 200 Montanans from all walks of life rallied outside the Missoula County Courthouse to show public officials we refuse to let our communities be sacrificed to the coal industry. 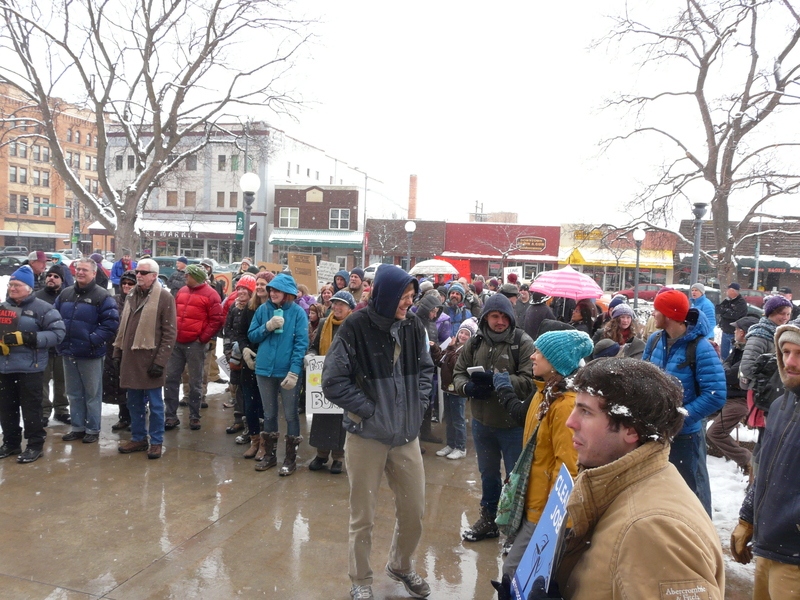 While a light snow sifted from the sky, a group that included students, elders, working people, residents of rail line neighborhoods, and many others gathered for Stop the Coal Train Strain, a public demonstration against coal export mining in Montana. It was inspiring to see so many people turn out to this action–especially considering the below freezing temperatures–and the diversity of ages and backgrounds was equally impressive. Clearly, this is an issue Missoulians are concerned about, and it’s no wonder: if coal export projects like Arch Coal’s proposed Otter Creek Mine go through, Missoula could see thirty more coal trains pass through our community each day. Not only would coal exports be a disaster for the climate, but each additional coal train adds to air pollution, noise, and severe traffic congestion in rail towns like Missoula. Other speakers–including local poet and organizer Rita Jankowska-Bradley, Naomi Odderman of Indian Peoples Action, and 350-Missoula Co-Chair Jeff Smith, spoke about Big Coal’s plans to profit off exporting coal to China, while destroying Montanans’ health, pillaging indigenous lands and tribal culture, and imperiling any hope we might have of avoiding catastrophic climate change. We then marched through downtown Missoula to the pedestrian crossing where a heavily-used residential street intersects with the railroad. If out-of-state coal companies get their way, this intersection will be clogged by trains dozens of extra times per day. Today’s rally, which was one of the largest public displays of opposition to coal exports in Western Montana so far, marked the culmination of months of work by Blue Skies Campaign volunteers. Back in the fall, we started canvassing neighborhoods along the rail line in Missoula, to talk with residents of the community that’s most immediately impacted by coal train pollution, and invite them to work with us on planning a community action against coal exports. In December, we began reaching out to the nine other organizations that eventually became co-sponsors of Stop the Coal Train Strain: 350-Missoula; Montana Environmental Information Center; Montana Sierra Club; Indian People’s Action; Community Action for Justice in the Americas, Africa, and Asia; UM Climate Action Now; Montana Elders for a Livable Tomorrow; Northern Plains Resource Council; and Missoula Community Food Co-op. With such broad-based support from the environmental and social justice communities, we were able to reach a much wider audience than would otherwise have been possible. Even so, when I saw the forecast for today’s weather, I was worried no one would show up. I should have known better; Montanans care about our air, land, and climate, and we’ll turn out into the streets in the hundreds when those things are threatened. With state and federal officials poised to make major decisions about whether to permit Montana coal export projects, the time to defend our communities is now. The fight against coal exports isn’t over. But today, seeing hundreds of people turn out to make sure our voices are heard gave me hope. In the months ahead, we’ll be ramping up our movement in new and ambitious ways. Stay tuned for more.